Forget about Egyptian cotton and high thread counts. There are no finer textiles then the Hibiol cloth woven by the legendary Iolph. They might look like teen aged girls, but they live through centuries without aging a whisker. The outside world mistrusts them and the feeling is mutual. 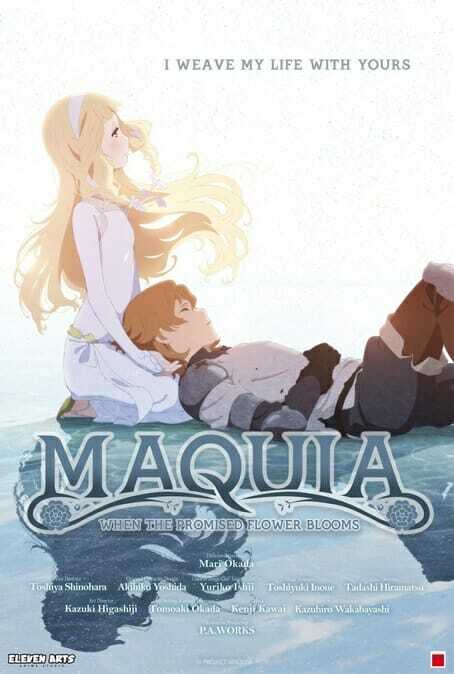 However, when a decaying empire tries to harness their genetic longevity, a (comparatively) young Iolph is thrust into a world she is destined to outlive in Mari Okada’s anime feature Maquia: When the Promised Flower Blooms (trailer here), which opens this Friday in New York. As a Iolph, Maquia is supposed to feel lonely, but that doesn’t make it any easier. She has resigned herself to a super-long life weaving Hibiol cloth, when the army of Mesate suddenly invades. The cornerstone of the regime’s power were the ancient Renato dragons they successful adapted for military purposes, but the last of the mythical beasts are dying. If the king takes an Iolph as his wife, his successor should in theory live long and prosper. In the process, Maquia is whisked away by a wounded Renato, who crashes into the outskirts of a bucolic human farming community. Soon thereafter, Maquia discovers a foundling still locked in its dead mother’s arms. Her maternal instincts compel her to adopt the infant she will name Erial, even though she knows she will outlive him by centuries. They spend a few happy years in that rural community, but eventually they must move on, to avoid attracting attention to her fantastical nature. She is sort of like John Oldman in The Man from Earth, but she is also a mother. Indeed, a great deal of Maquia addresses just what it means to be a mom, beyond simple biology. There is no question Okada set out to make viewers blubber like a baby. This is the mother of all sainted, sacrificing mother films. Yet, Okada also does some highly intriguing fantasy world-building. She could set entire films in the Mesate realm that did not feature Maquia or explore mother-son relationships. Frankly, she could have doubled the time allotted to the Renatos without trying viewer patience. Regardless, when she lowers the emotional boom, it leaves a large indentation. 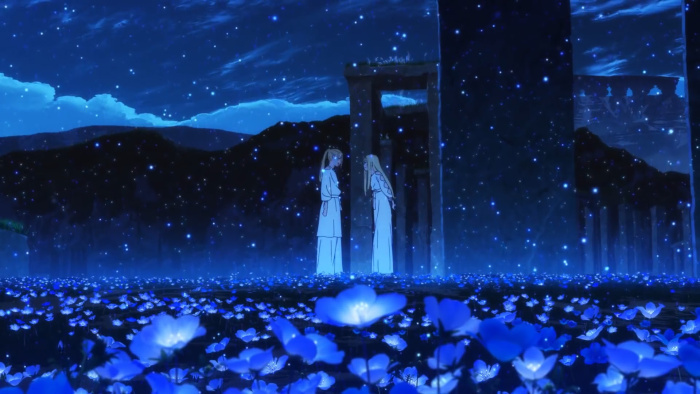 Visually, Maquia is also a rich, lush spectacle. The fantasy architecture is particularly arresting—so much so, we could easily envision it inspiring builders of the future. Arguably, this is the best-looking, most exotic-feeling animated film since Big Fish & Begonia, but it is as emotionally direct and resonant as Bambi. The social systems and backstory of Mesate are so compelling, we would have preferred more palace intrigue and less tear-jerking, but it is clear as day Okada fully realized her vision. Even the most aloof hipsters will get choked up at the end. Highly recommended for fans of sophisticated anime, Maquia: When the Promised Flower Blooms opens tomorrow (7/20) in New York, at the Village East.